While uploading the picture of a man tied with ropes in central Kashmir’s district Budgam a BJP parliamentarian has called for a “nationwide campaign” if any action is taken against Major Leetul Gogoi, who has allegedly tied him to a jeep. The Karnataka lawmaker tweeted this on Tuesday. 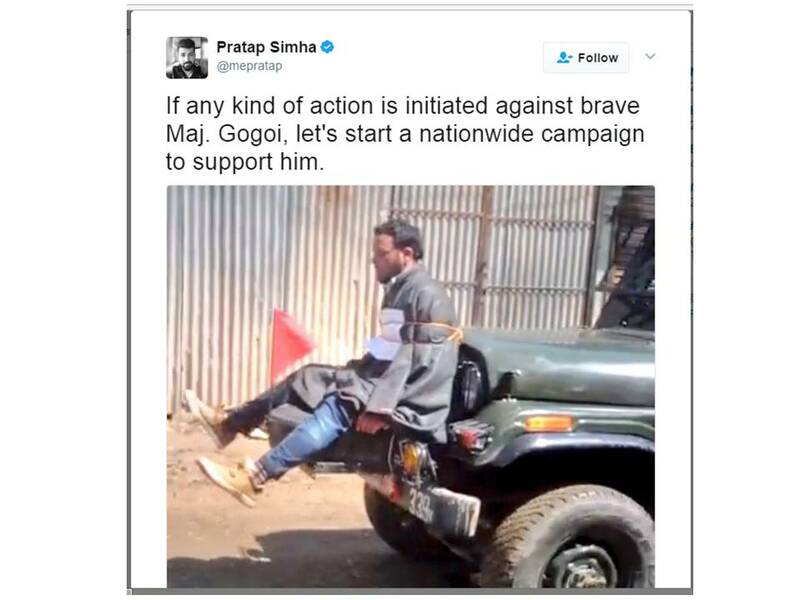 “If any kind of action is initiated against brave Maj Gogoi, let’s start a nationwide campaign to support him,” MP Pratap Simha tweeted on Tuesday. This message came a day after the India’s top law officer, attorney general Mukul Rohatgi, said the officer should be “applauded” and not criticized. After a video clip surfaced last week showing a man tied to a jeep army is in the middle of a controversy. The man who was seen tied to the army vehicle was identified as Farooq Ahmad Dar. A resident of Chill Arizal village of Beerwah, Farooq was tied with ropes and was used as a “human shield”.